“Have you ever tried kohlrabi before?” the tall, lean man asked over his shoulder, excitement growing on his face. Arthur Shavers looked like a schoolboy as he pushed his half-rim glasses up and focused his attention on the row of leafy greens waving in the breeze. He bent over, his fraying straw hat almost grazing the tips of the shimmering plants, and swam his hands through the crunchy leaves. His partner, Shantae Johnson, was already elbow-deep in greens, on the hunt for the wild cabbage nearby. Moments later, Johnson, who has a constant twinkle in her eye, emerged victorious, yanking a fist-sized, lilac-purple bulb out of the soil, its purple offshoots radiating like the filaments of a plasma globe. To an undiscerning passerby, this scene is nothing out of the ordinary: a happy couple harvesting vegetables in an urban farming lot in Northeast Portland. Except that in Oregon, and in most parts of the United States, there’s very little that’s ordinary about Johnson and Shavers’s farm. 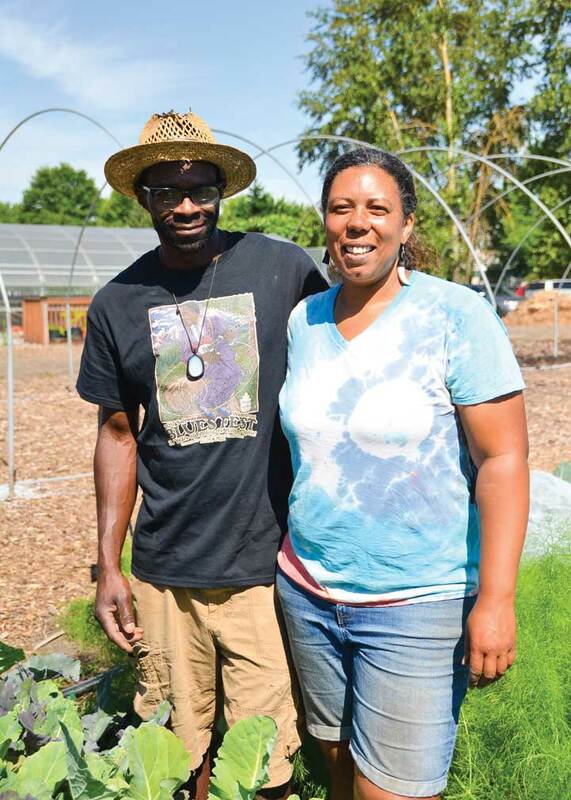 Mudbone Grown, the couple’s two-year-old small farm in Portland’s historically Black neighborhood, is located on a three-quarter-acre lot adjacent to the Oregon Food Bank. The space is imbued with the ethos of sankofa, a West African word meaning “to reach back and fetch it.” Here, the word channels a sense of longing and reconnection. Of possibility and change. Of rediscovery and reclamation. Johnson and Shavers fought for years to realize their long-running dream of farming and self-sufficiency while campaigning for inclusivity and opportunity in a field controlled almost entirely by the dominant culture. For them, farming is more than just a business venture: it’s a homecoming. A celebration of ancestors, heritage, and community, and a taking back of knowledge lost to time and trauma. Through community-oriented collective farming and a revolutionary farmer-training program designed for and led by people of color, the couple hopes to use their land as a way to revitalize a way of life that has been buried beneath centuries of oppression, rewriting the story of what it means to be a Black farmer in America in the process. Both Johnson and Shavers come from farming families. Shavers’s grandmother took care of the house and family, growing vegetables in the yard to help feed eleven children, while her husband worked in Portland’s shipyards. A young Arthur Shavers would eventually use his pocket money from weeding and planting in that garden for fireworks and new tennis shoes. Johnson’s family has roots in homesteading as well. Her grandmother, who owned seven acres of land in Oregon City, grew berries for Smucker’s. Nature was Johnson’s religion, and she spent her youth worshipping at its altar through camping, hiking, and watering the garden. When the two met ten years ago, they discovered their shared love of gardening and self-sufficiency and quickly realized that their homegrown fresh vegetables, giant sunflowers, and occasional chicken reduced their bills. They tried to garden at every place they lived, always dreaming about that one day when they’d have a farm of their own. Eventually, both Johnson and Shavers turned their energy toward careers in growth industries, trading the activities they enjoyed to focus on income and raising their six children. Shavers became a truck driver, leaving Johnson, their garden, and their children for months at a time to deliver goods to businesses and farms across the country—farms that he grew increasingly envious of. Johnson, a doula and breastfeeding peer counselor, worked in public health as a nutrition policy specialist for Multnomah County. But three years ago, they both realized they missed the hands-on work of agriculture and interacting directly with their community. They quit their jobs and applied to the Beginning Urban Farmer Apprenticeship program offered through Oregon State University’s Extension Service, hoping to focus once again on their shared goal of owning their own land and working for themselves. But the pursuit wasn’t without its costs. The program was expensive, totaling nearly $10,000 for both of them, and, in addition to tuition, it required hundreds of hours of labor. They were also the only people of color in the program, fighting battles that few, if any, of their classmates shared. Unlike many of their classmates, Johnson and Shavers had no access to land and had only limited capital to their names. For many people of color, and particularly farmers of color, breaking into the white-dominated agricultural space to have the opportunity to farm is often impossible, because land wealth and capital are insurmountable hurdles. Many people, even strangers off the street, interrogated Johnson and Shavers about their potential for success. “Especially our first year farming, there was a lot of questioning of ‘Do we have the ability to do something like this?’ ‘What makes you so special or have the right to have this kind of opportunity?’ And it still sometimes happens,” Johnson says. Interns and volunteers work at Mudbone Grown's Unity Farm. Landownership in Oregon, especially generational landownership, was born of racist policies and permanently shifted the demographics and landscape of the state. Under the 1850 Oregon Donation Land Law, white men and their wives of legal age, as well as “American half-breed Indians,” were eligible to own 320 acres, so long as they resided and made improvements on the land for four years, according to the Oregon Encyclopedia, a project of the Oregon Historical Society. African Americans and Hawaiians, however, were explicitly excluded. During the five years that the Donation Land Law was in place, Native populations across the state were systematically eradicated from their traditional hunting and gathering grounds as a way to “leave the whole of the most desirable portion open to white settlers.” By the law’s expiration in 1855, roughly thirty thousand white immigrants had entered the Oregon Territory. Nearly 4 percent of the state’s lands—some two-and-a-half million acres centered around the Willamette, Umpqua, and Rogue Valleys—was given to seven thousand individuals, enshrining Oregon’s future as a white-owned utopia. Halfway through the Beginning Urban Farmer Apprenticeship program, Johnson and Shavers quit and set out on their own, instead reaching out to local organizations like Leaven Community Center to make their dream a reality. They spent the 2015 season working at Arbor Lodge Urban Farm in North Portland, growing food for families and day cares in eastern Multnomah County. Even in the early days of their farming careers, Johnson and Shavers began to bring their community together, connecting with families in the Special Supplemental Nutrition Program for Women, Infants, and Children and the African American Breastfeeding Coalition to bring a diverse collection of community members to the farm. But by the end of the 2015, Central City Concern took the Arbor Lodge property back, eventually turning the space into affordable housing. Johnson and Shavers began their search again. They started going to meetings, asking people for land and teaching cultivating culture classes while looking for an accessible place to finally call home. Shavers picked up leatherworking on the side to help offset the bills. At the same time, the couple and three of their six children lived in a motor home during one of Portland’s harshest winters in recent past. Through Grow Portland, a nonprofit dedicated to growing food in Portland, they were connected with the Oregon Food Bank, which was looking to have someone manage the farm on its adjacent property. But weeks of having doors slammed in their faces and being turned down for grants had left the couple feeling discouraged about reaching out. On a particularly cold and uncomfortable night before Christmas 2016, Johnson, unable to sleep, finally e-mailed Christine Hadekel, the statewide education and outreach manager at the Oregon Food Bank. To her surprise, Hadekel responded within thirty minutes. Johnson was so happy and shocked, she ran to wake a sleeping and still-disheartened Shavers to show him the message. When they arrived at the farm that first year, in 2017, Johnson and Shavers were overwhelmed. The three-quarter-acre plot was larger than any space they had managed before. The fallow lot was home to a faded barn stuffed with tools, a single greenhouse still in use by the food bank, and very little else. Only half of the field was set up for irrigation. There was a smattering of plants already growing, as well as a small grove of cherry, plum, and apple trees, but most of the land was just grass. Eventually, they came up with a plan for how to utilize the vast space. They had a tractor till the land and took donations for starts. While the food bank used the greenhouse, Shavers turned their living room and bedroom into a makeshift—and ultimately unsuccessful—greenhouse. But they worked hard and persevered, as farmers do. That first year at Unity Farm, what Johnson and Shavers named their plot at the Food Bank, they organized a CSA (Community-Supported Agriculture) program for twenty low-income families in East County in conjunction with Zenger Farm and Veggie Rx, corralled eight hundred volunteers, and hosted Boys and Girls Clubs and garden tours. Their longtime friend and colleague Roberta Eaglehorse-Ortiz, founder of the Oregon Inter-Tribal Breastfeeding Coalition, shares a portion of the land. Her Wombyn’s Wellness Garden for pregnant and nursing mothers bursts with medicinal plants, herbs, flowers, and vegetables. Today, the land has been transformed. Dozens of varieties of celery, turnips, tomatoes, peppers, and collards grow in neat, picture-perfect rows; more crops are planted weekly with the help of interns and an impressive crew of volunteers. The thick, lofty stems of giant sunflowers poke their way through wispy fennel fronds and curly lacinato kale leaves. 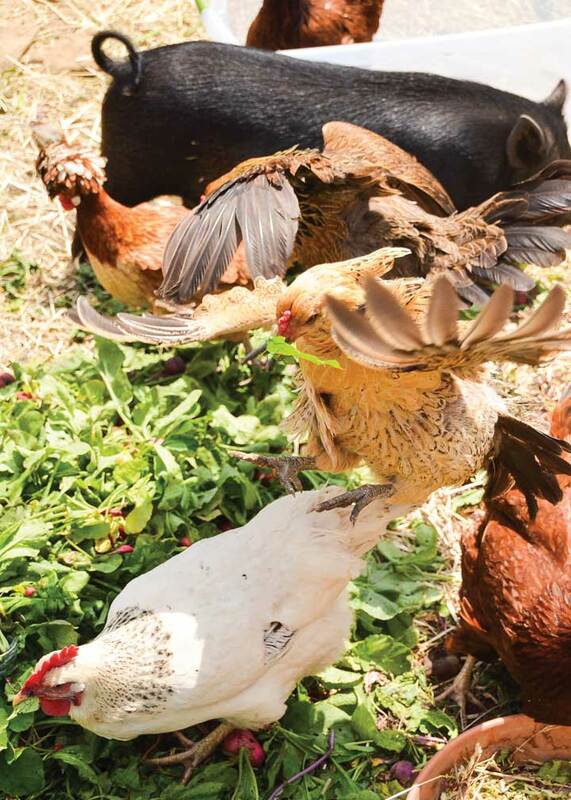 Chickens by the name of Beyoncé, Kelly, and Michelle, along with Lola the pig, mill around in a new coop and pen, munching on weeds and greens from the garden. Beehives are being installed near the back of the barn. And Mudbone is gearing up for the first week of their CSA, which will benefit twenty low-income families and another ten to fifteen Black elders in the community. But there’s still a long way to go. Arthur Shavers tills new dirt for planting. The partnership with the food bank provided land, water, tools, and resources for free; Johnson and Shavers wanted to find a way to include their community in that generosity. They felt an obligation to pay it forward. 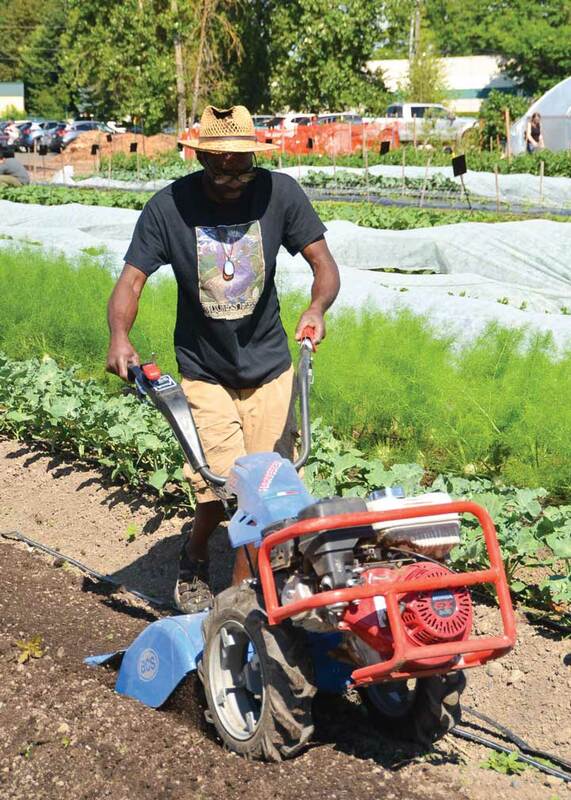 “We had always been saying if we had a program similar to the Beginning Urban Farmer Apprenticeship program, we would do all these things to remove barriers for people, and pay people instead of having them pay us,” Johnson says. Shavers had stumbled upon the USDA’s Outreach and Assistance for Socially Disadvantaged and Veteran Farmers and Ranchers Program, or the 2501 Program, which provided them, in conjunction with the Oregon Food Bank, with $200,000 to fund their inaugural Beginning Farmer Training Program for People of Color in 2018. In the premier program, Mudbone Grown manages the day-to-day planning of activities for the diverse group of interns, organizing workshops to equip them with the skills and knowledge required to make farming a viable business, all while providing them with a monthly stipend, bus card and CSA share. It’s a rare opportunity likely found in few other communities across the country for budding farmers of color. The curriculum is centered around food sovereignty and justice, and the program is imbued with a sense of collectivity and a shared leadership model, something both Johnson and Shavers are learning right alongside their students. For generations, farming in Oregon has offered limited ownership opportunities to people of color. It’s left many feeling alienated and yearning for an opportunity to get back into it. day and age, and helping people to see the value in knowing how to take care of yourself and your families,” Johnson says. For Johnson and Shavers, part of rewriting and reclaiming that narrative is being able to create social transformation through food, take care of their community, and go back to basic life skills and survival, much of which was lost during decades of trauma. 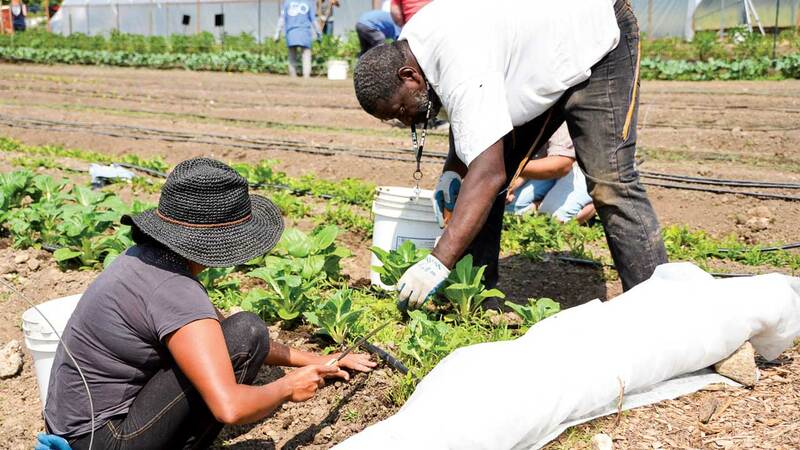 Mudbone’s Beginning Farmer Training Program is one of few such programs in the country specifically aimed at and run by people of color—if not the only one. More than fifty people showed up for their orientation session, and people from across the nation have reached out asking what the secret recipe is. Lola the pig and chickens Beyonce, Kelly, and Michelle eat scraps from the garden in their new pen behind Unity Farm. Mudbone Grown’s long-term goal is to return to the cooperative farm economics model used by the Federation of Southern Cooperatives Land Assistance Fund and other cooperatives across the country. They’d love to share 125 acres with other incubator farms in order to go after larger markets like hospitals and schools, and ultimately create systemic changes, opportunities, and jobs for people of color. Farmers of color in Oregon and across the country still have a long battle ahead in the fight for reclamation of land, ownership, and equal opportunities. 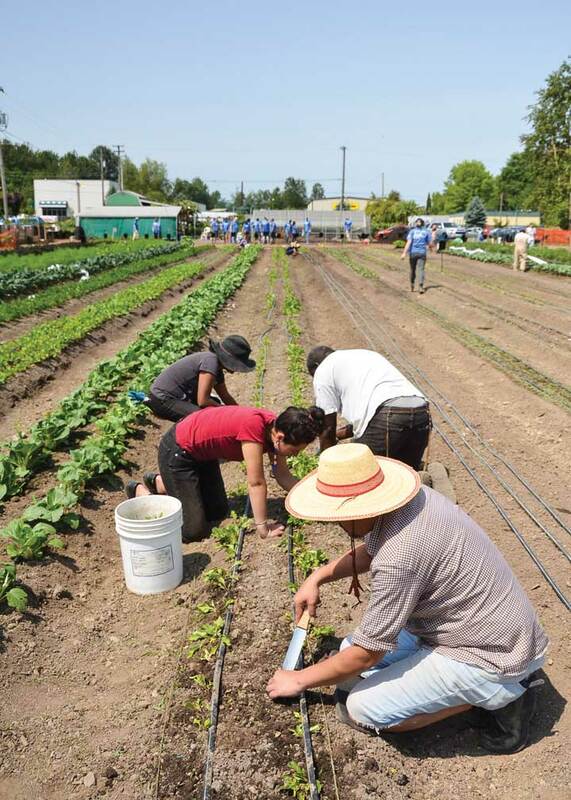 The Oregon Food Bank is working with Portland Metro and Multnomah County to graduate the 2018 class of interns from the Beginning Farmer Training Program for People of Color to their own pieces of land, as well as providing on-location technical assistance and market contracts. Some, Johnson, Shavers and the Food Bank are hoping, will return to teach at Mudbone Grown in the following years. Samantha Bakall is a Chinese American freelance journalist and photographer specializing in diversity-based food issues. She currently calls Portland home. Her work has appeared in the Oregonian, where she was the food and dining writer for more than four years, the San Francisco Chronicle, The Takeout, The Pulitzer Prizes, Travel Oregon, Portland Monthly, and more. Very well written article about my nephew and his wife. I am glad they got the opportunity to pursue their dreams as a couple of color in the state of Oregon. Praying for continued success and many more opportunities for younger generations to come. Writer Putsata Reang and filmmaker Ivy Lin explore the stories of Chinese laborers in the 1900s who helped establish the state's reputation as an international beer capital, despite exclusion laws that kept them from owning the hop farms where they worked.